The sanctuary at Good Shepherd decorated with beautiful flowers truly came alive as Bishop of Parramatta, Bishop Vincent Long OFM Conv concelebrated Mass with six priests of the diocese. We are grateful to them as well as diocesan MC Chris Ohlsen, Deacon Tan and three seminarians who served at the altar. Paul, husband of Annette Axiak who taught SRE until her illness late last year, lit the memorial candle at the start of Mass as we paused to remember past SREs who have died. Antoinette Mifsud, Parish Coordinator of Kingswood, received her 40 years of service award, Colin Morris, Connie Bennett and Anne Ledger received awards for 35 years, and Marie Trapp, Jane Agius and Rita Mangion for 30 years service as SREs. 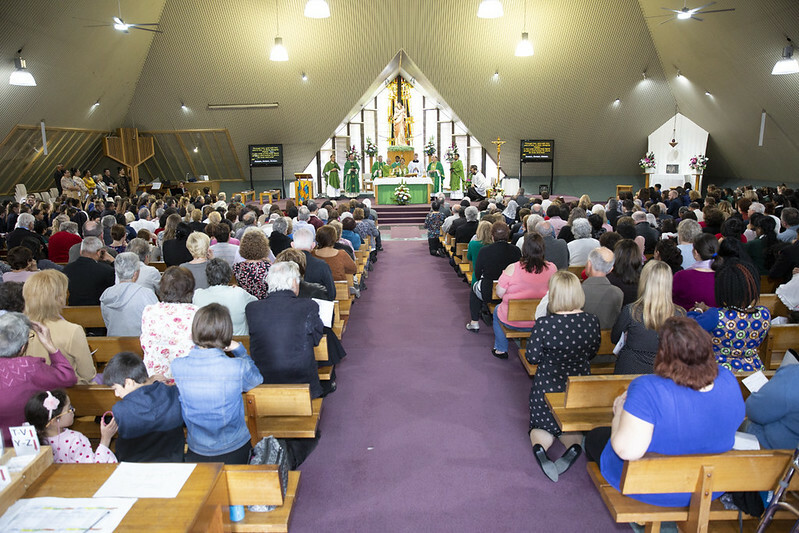 It is always exciting too for the volunteers who received their papal blessings for 20 years service: Veronique McMurray, Angela Tripolone, Gloria Yap, Jane Cauchi, Christabell Entwistle, Martin Maguire, Pamela Singh, Crystal Rodricks, Wendy Walsh, Jane Sultana and Thelma Mathias. This year we recognised three members of the CCD team for their dedication and commitment to SRE: Connie Cassar as Regional Coordinator of Blacktown Region for 21 years, Wendy Hord for 20 years coordinator of Hills Region and Maree Collis, manager of the CCD Office for the past 20 years. Congratulations to all the award recipients! We look forward to having more parishioners answer the call to this ministry.